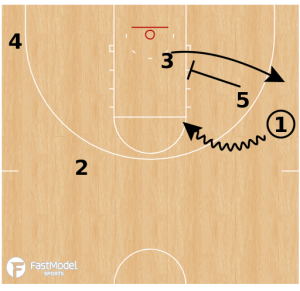 This Boston Celtics sideline inbounds play was contributed by Timothy Hipps to the FastModel Sports Basketball Plays and Drills Library. Timothy Hipps is an assistant coach at Central High School in Capital Heights, MD. He is also the founder of Math-n-Basketball Academy, a youth basketball organization that also offers academic support to players. Coach Hipps uses basketball statistics, scouting reports and game technology to integrate sports with mathematics and literacy in Maryland public schools. While coaching at amateur levels, he has sought to adapt NBA actions and offenses for youth and high school teams. Hipps is adamant about offering professional preparation, collaboration, and effort at the recreational and interscholastic levels. While a head basketball coach at the interscholastic level, Hipps’ teams won 3 league championships in five seasons. You can follow Timothy on Twitter @mathnbasketball. 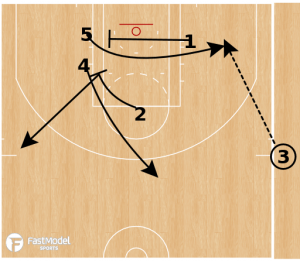 A nice ATO SLOB set run by the Boston Celtics in Game 2 vs the Milwaukee Bucks in the 2018 NBA Playoffs. Great for a team with post players who can pass out of the post. 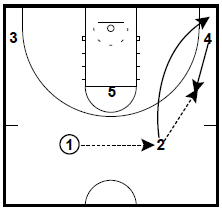 3 inbounds, 4 and 5 are stacked up on weak side block. 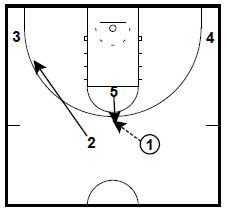 1 is on strong side block with 2 at nail. 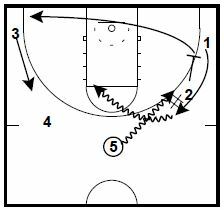 2 sets down screen for 4 to catch at top of key. Option for 4 to DHO with 2 (not shown). 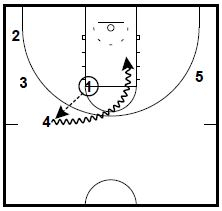 Primary look is to 5 in short corner after receiving screen from 1. 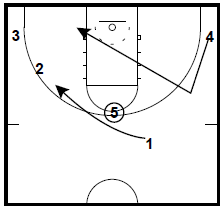 4 sells down screen for 1, who fakes coming off for shot. 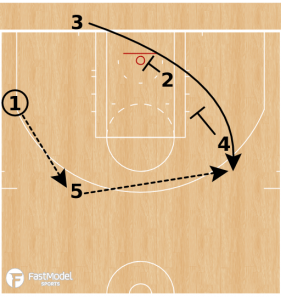 1 rejects screen and backdoor cuts to basket for layup. 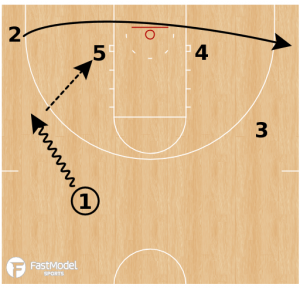 This series of similar plays run by the Boston Celtics was contributed by Doug Brotherton to the FastModel Sports Basketball Plays and Drills Library. Doug Brotherton is entering his 14th year of coaching basketball, and his 6th year at the helm of The Village School girls varsity basketball program. He has coached boys high school basketball, girls high school basketball, and started the Men’s Basketball program at Mid-Michigan Community College. Coach Brotherton is also very involved at all levels of basketball. He is a NBA Regional Advanced Scout for the Chicago Bulls. He is the Director of Coaching Development for HoopGrind Basketball. Coach Brotherton was elected as the Texas Association of Basketball Coaches Large Private School Board Member. This past year, Coach Brotherton helped develop the drill book and coaches packets for Jay Bilas Basketball Camps. In 2018, Positive Coaches Alliance selected Coach Brotherton as one of the 50 Double-Goal Coach National Award Winners, for his positive impact on his athletes on the court and in life. In a pivotal Game 6 of the 2017 NBA Playoffs, the Celtics were struggling offensively. 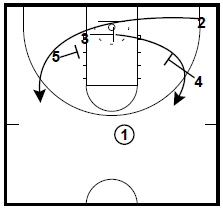 Brad Stevens is excellent at designing multiple set sequences, to help his team find a rhythm. 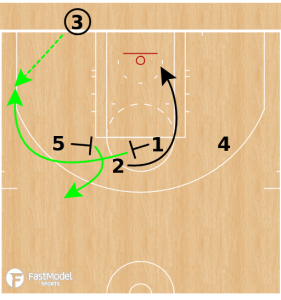 In the 2nd quarter, the Celtics ran this sequence, scoring on two of the three possessions. The only possession that they did not score was an open 3, which rimmed out. It was a terrific sequence, which kept the defense off balance. 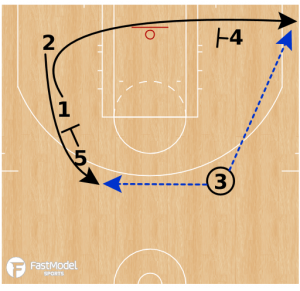 The second play on this post was contributed to The FastModel Plays and Drills Library by Kevin Bruinsma. Kevin is in his fourth season with the Youngstown State men’s basketball program & his second season as Assistant Coach after spending the previous two years as Director of Basketball Operations. Prior to joing the Youngstown State staff, Bruinsma served as the Director of Basketball Technology at the University of Portland for the 2012-13 season. 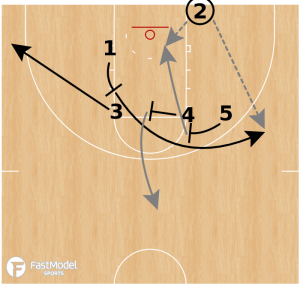 1 dribbles to wing, pushing 2 to corner. 1 enters ball to 5 in post. 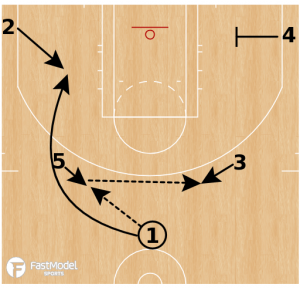 4 sets back screen for 3. 1 screens for 4 (STS action). 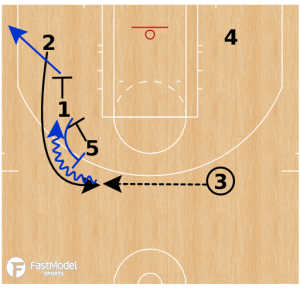 These two Baseline inbound plays is from Jay Wright. They were diagrammed in the FastModel Sports Basketball Plays and Drills Library by Jordan Peterson and Tony Miller. Jordan is the Founder and Director of Positionless Basketball. He is also the Varsity Assistant Coach at Stillwater High School in Minnesota. Tony is the assistant men’s basketball coach at Bob Jones University. 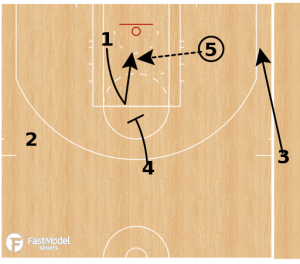 5 screens for 3 who curls and rubs 5’s defender so 5 can pop to wing. 5 hands off to a cutting 1. 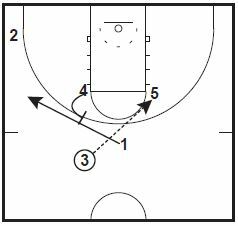 5 sets a down screen after the hand off. 1 back screens for 3. 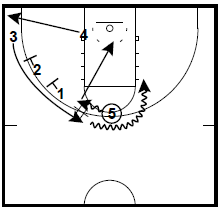 4 and 5 then set a stagger screen for 1. 2 can pass to 1, 5 or 4. 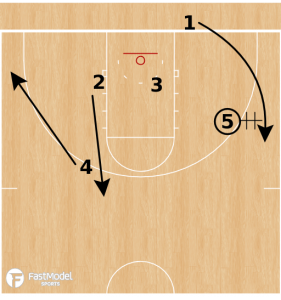 This Sideline inbound play is from the Villanova system. 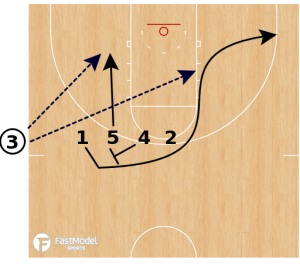 It was posted to the FastModel Sports Basketball Plays and Drills Library by Tony Miller. This is what Coach Miller had to say about the play. The Wildcats ran this SLOB several times during the semifinal matchup vs Kansas. 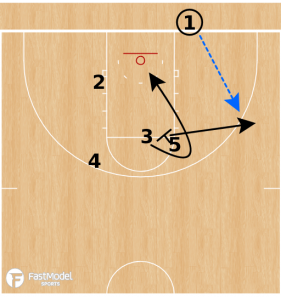 At the 13:17 in the second half, the inbounder looked to Spellman (5) for a short corner turnaround jumper (seen in Frame 1). In the first half (14:21), Brunson (1) used the ball screen to set up the fill behind shooter after Spellman’s ball screen (Frame 3). 5 dives to short corner. 4 screens for 1 who cuts to basket. 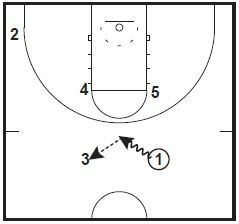 4 runs a dribble hand off with 1. 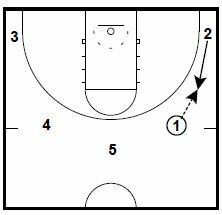 5 sets ball screen for 1. 1 can hit 5 on roll or pass to 4 on fill-behind. 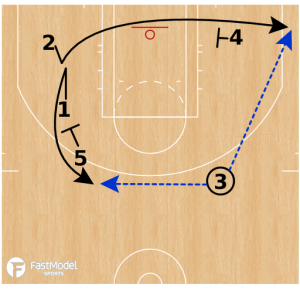 The 2 plays in this post came from the Basketball Hoop Scoop’s eBook (Assembled by Chris Filios) Michigan Two Guard Front Offense Playbook. This week’s featured eBook bundle is the Michigan Two Guard Offense Playbook and the Versatile Swing Offense Playbook. 4 fills up and back cuts. 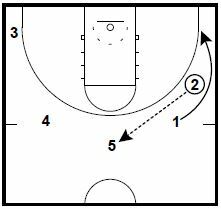 2 and 1 set stagger for 3. 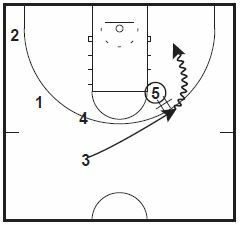 5 runs a dribble hand off with 3. 2 cuts to ball side corner. 5 spins out and pins down for 3 who back cuts. 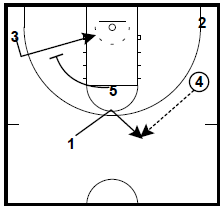 Staggered double action for 2. 3 comes off a single from 4. 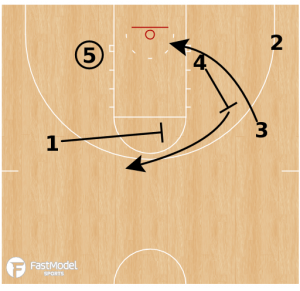 The following two plays from the Marshall Chaos Offense playbook assembled by Chris Filios for the Scott Peterman’s Basketball HoopScoop. 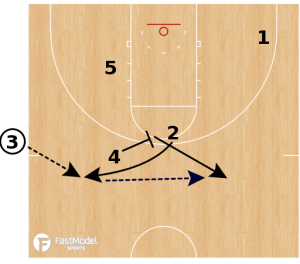 It is paired with The Spread and Go Motion Offense Playbook as this week’s featured bundle. You can find out more about the bundle by clicking on this link: Marshall Chaos and Spread and Go Offense Playbooks. Hopefully pieces of the plays on this page will be useful to you as you develop and continue to improve your offense. 1 sprints around 2 to the deep corner. 2 pins down for 1. 2 cuts through to corner. 4 drives the open gap. 4 sets fake flare for 1. 3 cuts off 5 for hand off. 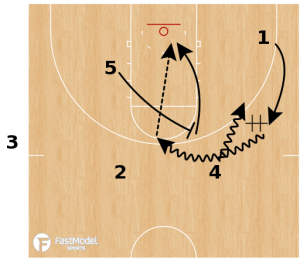 These two plays from the Marshall Chaos Offense playbook assembled by Chris Filios for the Scott Peterman’s Basketball HoopScoop.